This article is about the first generation Jeep Grand Cherokee. For an overview of all models, see Jeep Grand Cherokee. Export models produced at the plant in Graz, Austria, were given the vehicle designation of "ZG". The all-new 1993 Jeep Grand Cherokee ZJ offered many new and class-exclusive features that its competitors, such as the Chevrolet S-10 Blazer and Ford Explorer, did not offer. For example, all Jeep Grand Cherokee ZJ models featured a standard front driver's-side SRS airbag in the steering wheel. The Limited model offered a digital climate control system. All models offered a digital Electronic Vehicle Information Center (EVIC) that monitored critical vehicle systems and provided audible and visual feedback when a fault was detected (doors, hood, tailgate, engine coolant level, engine oil level, and front and rear lighting systems were some of the systems monitored by the EVIC). In addition to monitoring vehicle status, the EVIC could also display current date and time information and vehicle service interval reminders, and could be set via buttons on the EVIC screen. An overhead console provided a mini trip computer with current direction of travel and exterior temperature information in Celsius or Fahrenheit, as well as elapsed time, mileage remaining until the fuel tank is empty, and trip mileage for two trips (Trip A and Trip B). In addition to the mini trip computer, the overhead console provided storage for a single garage door opener, and two pairs of sunglasses, and included four overhead map/reading lamps. Keyless entry allowed for easy access to the vehicle without having to insert the vehicle's key into the door lock cylinder, and could also arm or disarm the class-exclusive vehicle security system. The interior lights illuminated whenever a door was opened, and could shut off automatically along with the automatic headlamps. The ignition cylinder was located on the right side of the steering column, and was lighted so that it could be easily located during nighttime driving conditions. Finally, a premium AccuSound factory audio system by Jensen (or Infinity Gold on 1994 and newer models) and 120-watt amplifier located underneath of the rear bench seat could be paired with an in-dash CD player and five-band graphical equalizer for a high-fidelity audio experience. A fully electronic four wheel drive system could detect when a wheel was losing traction, and send all available traction to that wheel in order to keep it on the ground. In addition, the system, called Quadra-Trac, could automatically detect when four wheel drive was needed, and automatically switch from rear wheel drive without input from the driver. The Grand Cherokee ZJ also offered Chrysler's 318 cubic inch (5.2L) Magnum electronically fuel-injected V8 engine as an option, which produced 220 hp (164 kW) and 280 lb⋅ft (380 N⋅m) of torque for up to 5,000 lbs. of towing capacity, and was the only SUV in its class at the time to offer a V8 engine as an option. In 1996, even more new features were added to the Jeep Grand Cherokee ZJ. The newly available Jeep Memory System utilized a button panel located on the inside of the front driver's door panel to recall driver's seat adjustment, mirror adjustments, and radio preset settings when the corresponding key was inserted into the ignition cylinder (each keyless entry remote was engraved with either a '1' or a '2' to designate which key would automatically recall these settings). Heated seats also became available for the front driver and passenger with slide switches located near the lighting controls on the driver's side. A power tilt-and-sliding sunroof was added to the options list, and remote controls for the audio system were added to the back of the steering wheel on some Grand Cherokee models. For the first time on the Grand Cherokee, buyers could choose a combination cassette and single-disc CD player instead of just either a cassette or a single-disc CD player. Dual front SRS airbags now came standard on all models, and the 5.2L Magnum V8 engine gained 5 lb. ft. of torque, up to 285 from 280, and remained one of the most powerful SUV's in its class. 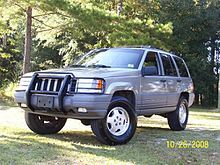 Finally, in 1998, the 5.9L Limited model became available for the Jeep Grand Cherokee ZJ, utilizing Chrysler's 360 cubic inch (5.9L) Magnum electronically fuel-injected V8 engine producing 245 horsepower and 345 lb. ft. of torque, which made the Grand Cherokee ZJ 5.9L Limited the most powerful SUV in its class. The Grand Cherokee (ZJ) was initially available in three trim levels: base, Laredo, and Limited. The base model included features such as full instrumentation, cloth interior, a standard five-speed manual transmission, and was given the "SE" name for the 1994 model year. Power windows and locks were not standard equipment on the base and SE for 1993 and 1994. The minimal difference in price resulted in low consumer demand, so the low-line model was discontinued after 1994. Standard features on all models included a driver-side air bag and four-wheel anti-lock braking system (ABS). The Laredo was the mid-scale model with standard features that included power windows, power door locks, and cruise control. Exterior features included medium-grey plastic paneling on the lower body and five-spoke aluminum wheels. The Limited was the premium model, featuring lower body paneling that was the same color as the rest of the vehicle. The Limited also had standard features such as leather seating, power sunroof, heated mirrors, heated power seats, and a remote keyless system. The "Up-Country" version was also offered between 1993 and 1997, often painted "Champagne Pearl" or black. It came with 4WD and the AMC straight-6 4.0 L engine. Package groups included: convenience, fog lamps, skid plate, lighting, luxury, power, security, and trailer towing. When it was first introduced in April 1992 as an early 1993 model year vehicle, the Grand Cherokee had one powertrain, the AMC-derived 4.0 L Power Tech I6 engine that produced 190 horsepower. Transmission choices were a four-speed automatic transmission (early production ZJs used the AW4 - the A500SE (later 42RE) which replaced the AW4 during the latter half of the 1993 model year) or an Aisin AX15 manual transmission. Low sales demand for the manual transmission resulted in its discontinuation after the 1994 model year for North America, but it remained on the option list for European ZJs. The drivetrain choices included rear-wheel drive or four-wheel-drive. The all-new, 1993 Jeep Grand Cherokee went on sale in April 1992 in Base, Laredo, and Limited trims. At launch all Grand Cherokees were powered by the 4.0 L Power Tech Inline Six-Cylinder engine, and were all four-wheel drive. Starting in early 1993, the Grand Cherokee became available with the 5.2 L Magnum V8 engine, and a Grand Wagoneer Limited model became available with standard four-wheel drive and V8 power, as well as a plush leather-trimmed interior and faux vinyl woodgrain side and tailgate paneling. The 5.2 L Magnum V8 engine was available with the Quadra-Trac computerized four-wheel drive system, which was the first computerized system in its class. The Quadra-Trac system was a permanent four-wheel drive system that switched between Two Wheel Drive (Rear Wheel Drive) and four-wheel drive, though could be locked into four-wheel drive when desired by the driver. However, the system required little to no driver input, as it was automatically determined by the computer when four-wheel drive was required, and all available traction could be sent to one wheel. In addition to Quadra-Trac, a Selec-Trac Full-Time four-wheel drive system was available that was a "Shift-on-the-Fly" four-wheel drive system with automatically locking hubs and a second gear. The standard part-time four-wheel drive system in the Grand Cherokee was known as Command-Trac, a single-speed four-wheel drive system without a second gear. All three four-wheel drive systems featured a selector lever that was located next to the transmission gear selector or shifter. Two Wheel Drive Grand Cherokees featured a small storage area in place of the four-wheel drive selector lever. In late 1992/early 1993 calendar year, Chrysler made some minor changes to the 1993 model year Grand Cherokee. The changes are shown in The New Jeep, a brochure on the 1993 Jeep Grand Cherokee published in 1992. 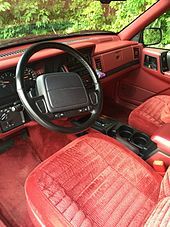 The crimson-colored interior option for the vinyl and cloth seats was no longer available, and the Limited model now had the option of quilted Highland-grain leather seats. The 5.2 L High-Output Magnum Engine V8 producing 220 horsepower was added in early 1993. The only transmission choice was a 46RH, four-speed automatic transmission. The Jeep Wagoneer Limited was also shown in the brochure, as it became available in early 1993. The radio face was changed for the AM/FM cassette player in early 1993, with raised buttons and rounded knobs, as well as larger green display text to match the rest of the Grand Cherokee's interior. The radio also introduced Dolby noise reduction technology for the cassette player. Full-faced steel wheels replaced the six-spoke version on the Base/SE model. For 1994, the upgraded Jensen Electronics AccuSound premium amplified audio system was rebranded Infinity Gold, with upgraded components. An AM/FM stereo with in-dash CD player became available for the first time. Mid-level Laredo models gained standard fifteen-inch sport aluminum-alloy wheels. The Grand Wagoneer Limited model was dropped for 1994, while the Base trim level is renamed the SE. The Aisin AW4 four-speed automatic transmission was revised for 1994, becoming the Chrysler-built 42RE. In 1995, the performance of the V8 engine was upgraded to 300 lb⋅ft (407 N⋅m) from 285. The 1996 model featured cosmetic changes to the body including the grille, bumpers, and foglights, while interior additions included dual airbags. The AMC 4.0 L straight-6 engine, rated to tow 5,000 lb (2,268 kg), was also refined with more torque and quieter operation. The 1996 Limited model also included more luxury items such as driver placement memory, radio controls on the steering wheel, and variable-assist power steering. An uplevel Orvis Edition model of the Grand Cherokee was introduced in partnership with Orvis catalog, adding features to the uplevel Limited model such as perforated tan and Moss Green leather-trimmed seating surfaces and front and rear door panels, an AM/FM stereo with in-dash CD player, and unique exterior trim and fifteen-inch aluminum-alloy wheels to the Limited trim. A flip out rear glass hatch was standard with the Orvis, along with font lettering which was similar to other Chrysler products (which was phased in the following model year). The base SE trim level received more standard equipment such as power windows and door locks, Antilock Braking System (ABS), keyless entry, an AM/FM stereo with cassette player, air conditioning, and upgraded fifteen-inch styled steel wheels. The five-speed Aisin AX15 manual transmission was also no longer available for 1995. For 1996, the Grand Cherokee received a mid-cycle restyling, with new front and rear bumpers and side cladding, a larger front grille, new aluminum-alloy wheel options, and an entirely new interior, now featuring a front passenger side airbag and revised interior fabrics. A combination AM/FM stereo with cassette and CD players became available, as well as a rear-mounted multi-disc CD changer unit. The base SE trim level was dropped for 1996, leaving the Laredo as the new base model. The five-speed manual transmission option was also dropped for 1995. At this time, the part-time Command-Trac four-wheel drive system was dropped, leaving the full-time Selec-Trac and computerized Quadra-Trac four-wheel drive systems as options. A new steering wheel which featured three-spokes with integrated cruise control buttons, a new dual-note horn, and the horn buttons were deleted in favor of a single horn pad. The front seats were new as well as an upgraded interior with new door panels and interior trim panels, a glove box with more storage space, new tires and wheels, revised headlamps, fog lamps that were directly integrated into the vehicle's front bumper on some models, a new remote keyless system, as well as faux wood interior trim standard on all models. An optional rear lift glass (first introduced with the 1995 Orvis edition where production tailgates manufactured after January 3, 1995 have both provisions for both fixed and lift glass) for the Laredo and Limited were added to the options list (the fixed glass came standard). The base SE model was dropped for 1996, in favor of new features being added to the Laredo (now base) model. The Grand Cherokee now offered standard power windows, power door locks, rear door child locks, keyless entry, AM/FM radio with cassette player and compact disc player and four standard speakers, cloth seating surfaces, and more. The manual transmission was no longer offered after the 1994 model year Grand Cherokee sold in North America, but remained as the base transmission for European ZJs (ZG) sold in Europe with the diesel motor. New front door designs got new side body cladding strips, and the 'Laredo' subtext on the Laredo model was moved down to the cladding. The 'Grand Cherokee' badge was relocated to the front lower doors, and was now larger (using a font style similar to other Chrysler products and initially used with the 1995 Orvis package), replacing the 1974-era American Motors font style used on Jeep vehicles. On V8-equipped Grand Cherokees, there was a new V8 badge on the rear liftgate. The 4X4 badge, on four-wheel-drive-equipped Grand Cherokees, was also changed to raised metal letters instead of the 4X4 decals offered before. A combination cassette player and CD player was available for the first time as an option, and the vehicle featured an OBD II diagnostics port under the dashboard on the driver's side, required for all 1996 model year and newer vehicles, a digital odometer and trip odometer, a 120 miles per hour speedometer rating on some models, and the vehicle now included some user-programmable features such as if the headlamps and tail lamps flashed when a button was pressed on the remote keyless system, how many miles until service intervals, whether the horn sounded when a button was pressed on the remote, and more. The overhead console was somewhat redesigned for the 1996 model year to improve storage space and feature availability. In addition to the cigarette lighter port, a 12-volt power port was added for cellular telephones, coolers, computers, and other devices. The ashtray was also removed from the rear doors, replaced by a solid area. The Limited model and Orvis Edition model both got chrome interior door handles. The engine rating was reduced by 5 horsepower to 185 to meet EPA regulations for the 1996 model year production. For 1997, a new trim level of Grand Cherokee, the Special Edition, was introduced, adding the Infinity Gold premium amplified audio system, an AM/FM stereo with cassette and CD players, dual power-adjustable front bucket seats, color-keyed exterior trim, and a security system to the base Laredo model. The TSi, also based on the base Laredo model, added unique sixteen-inch sport aluminum-alloy wheels, unique front and rear bumpers and side cladding, an AM/FM stereo with cassette and CD players, dual power-adjustable front bucket seats, luxury leather-trimmed seating surfaces with dual heated front bucket seats, dark gray wood interior trim, and a security system to the Laredo trim. The 5.2 L Magnum V8 engine was now available with Two-Wheel-Drive (Rear-Wheel-Drive). For 1998, the first-generation Jeep Grand Cherokee ZJ entered its final year of production. For 1998, a new performance-oriented 5.9 L Limited model was introduced, adding the 5.9 L Magnum V8 engine from the Dodge Ram 1500 pickup truck, unique forged sixteen-inch aluminum-alloy wheels, unique ruffled luxury leather-trimmed seating surfaces and front and rear door panels, an AM/FM stereo with cassette and CD players, a unique ten-speaker, 180-watt Infinity Gold premium amplified audio system, a unique mesh grille and a vented performance hood to the standard Limited model. The Orvis Edition was also dropped for 1998. Production ended of the first-generation Jeep Grand Cherokee ZJ in mid-1998, as production of its successor, the second-generation Jeep Grand Cherokee (WJ), began at Jefferson North Assembly, following a retooling of the plant. In 1998, a 5.9 L Limited model featured the 5.9 L V8 Magnum engine producing 245 horsepower with all-wheel-drive and a four-speed automatic transmission. This engine and model was only available for the 1998 model year. 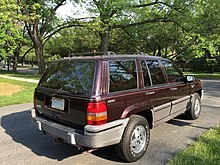 Between 1996 and 1998, the export Grand Cherokee Laredo (marketed for Japan) had the optional Aspen package (source: The Story of Jeep). In the mid-late 2000s (as they passed the 15 year mark), Japanese Domestic Market (JDM) Jeep Grand Cherokees that came in right hand drive became a popular vehicle choice for Canadian Mail Carriers since it shared the same chassis, body, suspension, and engine as the North American left hand drive version. The Base and SE (1993-1995) were the most basic trim levels of the Grand Cherokee between 1993 and 1995. The Base was given a name, the SE, in 1994. Standard features included the 4.0L "Power-Tech" Inline Six-Cylinder (I6) engine with 5-speed manual transmission, full instrumentation, vinyl-and-cloth trimmed seating surfaces, front high-back bucket seats, a split-folding rear 60/40/60 bench seat, an AM/FM stereo with 4 speakers, manual roll-up windows and door locks, and fifteen-inch (15") styled steel wheels. In 1995, the SE gained standard power windows and door locks, as well as keyless entry, air conditioning, an AM/FM stereo with cassette player, warning chimes, and a 4-speed automatic transmission. The SE was dropped after 1995, and in 1996, the Laredo became the base trim level of the Grand Cherokee. The Laredo (1993-1998) served as the midrange trim level of the Grand Cherokee between 1993 and 1995, and the base trim level of the Grand Cherokee between 1996 and 1998. It added these features to the base SE Grand Cherokee: fifteen-inch (15") alloy wheels, an AM/FM stereo with cassette player, air conditioning, warning chimes, cloth seating surfaces, keyless entry, power windows and door locks, a chrome front grille, and body-side cladding and molding. In 1996, the Laredo became the base trim level of the Grand Cherokee, and remains the base trim level to this day. In 1995, the Laredo gained a standard 4-speed automatic transmission, as the 5-speed manual transmission was dropped after 1994. Many of the features available on the luxurious Limited model could also be had on the midrange or base Laredo model. The Special Edition (1997-1998) was slotted just above the base Laredo trim Grand Cherokee between 1997 and 1998. It added the following features to the basic Laredo trim: a premium 120-watt Infinity Gold sound system with 6 speakers, an AM/FM stereo with cassette and CD players, power front bucket seats, a security system, color-keyed body-side trim and front and rear bumpers (sourced from the Limited), a 'Special Edition' emblem on both front doors, and more. The TSi (1997-1998) served as the "sporty" trim level of the Grand Cherokee between 1997 and 1998. Slotted above the base Laredo trim, the TSi added additional features to the basic Laredo trim that included sport alloy wheels, blue front and rear bumper and side trim accents, sport leather-trimmed and perforated seating surfaces, heated front bucket seats, an AM/FM stereo with cassette and CD players, a premium 120-watt Infinity Gold sound system with 6 speakers, and a security system. The Limited (1993-1998) served as the "luxury" trim level of the Grand Cherokee between 1993 and 1998. It added these features to the midrange Laredo Grand Cherokee: premium leather-trimmed seating surfaces, premium low-back front bucket seats, power front seats, a premium 120-watt Infinity Gold sound system with 6 speakers, fifteen-inch (15") or sixteen-inch (16") luxury alloy wheels, a security system, 4-speed automatic transmission, an Electronic Vehicle Information Center (EVIC or VIC), carpeted floor mats, body-colored front grille, front and rear bumpers, gold-plated badging, and body-side cladding and trim, and more. The Orvis Edition (1995-1997) was a partnership between the Orvis catalog and Jeep. Based on the Limited model, and available between 1995 and 1997, it offered two exterior color options, either Moss Green Pearl Coat or Light Driftwood Pearl Coat, an AM/FM stereo with CD player, unique beige-and-green luxury leather seating surfaces with red piping and matching door panel accents, luxury fifteen-inch (15") or sixteen-inch (16") alloy wheels with Moss Green-painted accents, a power sunroof, heated front bucket seats, unique beige-and-green carpeted floor mats with red piping, a beige-and-green leather spare tire and spare wheel cover with integrated storage pockets, and more. Jeep ended their partnership with Orvis in 1997, and thus, the Orvis Edition Grand Cherokee was discontinued after 1997. 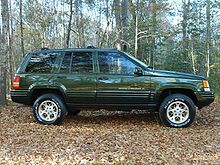 The 5.9 L Limited (1998 only) The 5.9 Limited was a Jeep Grand Cherokee produced only for the 1998 model year, having more luxury and performance than that of the regular Limited. Chrysler manufactured nearly a quarter million Grand Cherokees in 1998. Of those, fewer than fifteen thousand were 5.9s. It housed a Magnum 5.9 L V8 engine with an output of 245 hp (183 kW) and 345 lb·ft (468 N·m) of torque, going from zero to 60 mph (100 km/h)in only 7.3 seconds (Motor Trend measured this at a slightly faster 6.8 seconds), making it the quickest SUV available that year. The performance of the 1998 5.9 L V8 has been surpassed by Jeep only with the introduction of the 2006 Jeep Grand Cherokee SRT-8, which housed a 6.1 L Hemi Engine. The 5.9 Jeep Grand Cherokee was named the 1998 four-wheel drive vehicle of the year by Petersen's 4-Wheel & Off-Road magazine. The 5.9 Limited was available only in Deep Slate, Stone White, Bright Platinum. European version named 5.9 Limited LX and had two additional colors: Forest Green (rare) and Deep Amethyst. unique leather door inserts, armrests and console lid. The Grand Wagoneer Limited served as the most luxurious Grand Cherokee trim level for 1993, offering features in addition to the luxurious Limited features: quilted leather seating surfaces, faux vinyl wood side paneling, 'Grand Wagoneer' emblems on both upper front fenders, more wood interior trim, the deletion of the body-side cladding panels, the 5.2 L Magnum V8 engine, 4X4 only, and a chrome front grille. Meant to pay homage to the then-recently discontinued Jeep Grand Wagoneer SJ, the Grand Wagoneer Limited was discontinued after 1993. Four-wheel drive systems included Command-Trac, a part-time unit offering temporary 4-wheel assistance; Command-Trac was dropped from lineup in conjunction with the SE trim in 1996. Selec-Trac had the option of either full-time or part-time operation; both shift-on-the-fly Command-Trac and Selec-Trac were already available for the Cherokee, and they were adapted to the Grand Cherokee. Exclusive to the Grand Cherokee was the introduction of Quadra-Trac system with permanent all-time four-wheel assistance. This was optional on all models. Low-range required using a manual shift lever for all three systems. The Quadra-Link suspension design was used on both the front and rear axles. This design uses four control arms, two above the axle and two below it, to control longitudinal movement and rotation about the lateral axis (drive and braking reaction). A panhard rod, also referred to as a track bar, is used to locate the axle laterally. Two coil springs are seated on top of the axle housing as well as two gas-charged shock absorbers. The optional "Up Country" package included heavier duty German made gas charged shocks installed upside down, taller coil springs and longer bump stops; thereby increasing ride height by one inch. There were several different "one-off" and special edition models of the ZJ. For 1993, Jeep reintroduced the Grand Wagoneer for one year as a special luxury version of the Grand Cherokee. It featured an extensive list of standard equipment including a 5.2 L V8 engine and unique leather interior as well as the Grand Wagoneer’s traditional exterior simulated woodgrain applique. Positioned above the Grand Cherokee Limited, it was the most expensive model of the Jeep line available that year and was produced in limited numbers. The Orvis (1995–1997) was a Grand Cherokee Limited package that featured an exterior color scheme of Moss Green, or in 1997 the (less common) Light Driftwood, with roan red and maize side strip accents (1995). Moss Green paint accents on the road wheels (matching the moss green body color) and the special "Orvis" brand badging were the only significant exterior visual differences. In performance, the 5.2 V8 engine became standard, but was available with a 4.0 inline 6-cylinder engine. Also, some Orvis editions came with a rear liftglass (which in 1996 became a mainstream option), tow hooks, and the Up-Country suspension group. However, the interior was special. Two-tone green and tan leather seats were complemented with roan red accent piping and Orvis insignia. There was a slight difference between the 1996 and 1997 years' interior compared to each other. The 1996 had a black dash where the 1997 had a tan dash, The Orvis Edition luxury trim package was optional on the Limited version, and when equipped with all the other options was the most expensive of all the Grand Cherokee versions until 1998 when the 5.9 Limited was introduced. Jeep ended their relationship with Orvis Catalog in 1997, and the Orvis Edition was discontinued. A sporty TSi model (1997–1998) briefly debuted, exterior features included single color body paneling with lower indigo blue striping, a body colored grille, and TSi accent similar to that found on the Eagle Talon model. "TSi" really is a misnomer on the Jeep. Both Jeep and Eagle were originally built by AMC. The AMC Eagle TSi was a "Turbo Sport Injection," and, on that model, included a turbo. Eagle had intended to create a TSi Grand Cherokee; Chrysler did not agree, but nevertheless copied over the TSi logo. The TSi could only be ordered in select colors, which included Black, Platinum, and Deep Amethyst. TSi packages came equipped with 5 spoke 16-inch (410 mm) alloy wheels, 225/70R16 Goodyear Eagle GA tires, fog lights, Luxury group, featuring: "Highland" perforated, power, leather seats, overhead computer, and a premium sound system with steering wheel mounted controls. Contrary to popular belief, the suspension used on the TSi was the standard duty Quadra-Coil suspension used on all non-UpCountry ZJs. Both the 4.0 I6 and the 5.2 V8 were available. Quadra-Trac was standard with the TSi package for both engines, while Selec-Trac was optional with the I6. Both engine options could also be special ordered in 2 wheel drive configurations. The TSi was priced between the Laredo and the Limited and was discontinued after a two-year run. The 5.9 Limited was produced only for the 1998 model year, having more luxury and performance than that of the regular Limited. Chrysler manufactured nearly a quarter million Grand Cherokees in 1998. Of those, fewer than fifteen thousand were 5.9s. Standard was a Magnum 5.9 L V8 engine producing 245 hp (183 kW) and 345 lb⋅ft (468 N⋅m) of torque and capable of accelerating from zero to 60 mph (97 km/h) in 7.3 seconds (Motor Trend measured this at a slightly faster 6.8 seconds), making it the quickest SUV available that year. The 5.9 Jeep Grand Cherokee was named the 1998 four-wheel drive vehicle of the year by Petersen's 4-Wheel & Off-Road magazine. The 5.9 Limited was available only in Deep Slate, Stone White, and Bright Platinum. European version named 5.9 Limited LX and had two additional colors: Forest Green and Deep Amethyst. It was also Petersen's 4x4 of the Year in 1993, 1996 (with the redesigned NV249 transfer case), 1998 (with the newly available 5.9 L V8), 1999 (with its acclaimed second generation model), 2001 (with the new 5-speed transmission), and 2005 (with its third generation model). The Grand Cherokee V8 received many awards from smaller enterprises, newspapers, and blogs such as Best Vehicle of the Year from the Asheville Chronicle 1996-2000, Beta Blog's Best Family 4X4 1995-1998, and "Best 4x4" from Bearded Monthly. Since 2011, the latest WK2 Grand Cherokee has been dubbed the "Most Awarded SUV Ever" due to the number of awards it received when it was redesigned in 2011. Jeep introduced several concept vehicles for its annual Easter Safari in Moab, Utah. One such vehicle was the Jeep Grand One, which was created to celebrate the 25th anniversary of the Jeep Grand Cherokee. This vehicle was based on a stock Stone White 1993 Jeep Grand Cherokee ZJ Laredo 4X4 equipped with the 5.2 L Magnum High-Output V8 engine and 46RH 4-speed automatic transmission, which the automaker purchased off of Craigslist specifically for the project. The Grand One was repainted a robin's-egg blue with a light woodgrain-style treatment underneath of the paint, paying homage to the 1993 Jeep Grand Wagoneer ZJ, and the wheelbase was stretched to accommodate new front and rear axles (however, this is only noticeable if one looks at the slightly modified rear doors that had to be modified to accommodate the longer wheelbase). Large front and rear fender flares conceal the extended wheelbase. The Grand One also receives large, off-road capable tires, custom eighteen-inch laced aluminum-alloy wheels, a slight lift, an eight-slot gloss black-finished front grille, 2017 Jeep Grand Cherokee-style 'GRAND CHEROKEE' emblems on the front doors and rear tailgate, and a new '5.2' emblem on the rear tailgate. Pinstripes on the side and rear of the body were removed, as was the textured side cladding, and the 'Jeep' emblem on the hood. Underneath the Grand One's hood, all components are stock Jeep except for a Mopar air filter and intake. Inside, the interior of the Grand One is mostly stock, except for new upholstery (the stock seats of the Grand One were re-wrapped in a modern gray leather-and-microfiber-suede with bright blue accent stitching), and a plaid headliner. Retro touches, such as the factory AM/FM radio with cassette player that has a cassette tape sticking out of the tape deck, an Audiovox car phone, and an original Nintendo Game Boy on the rear seat are eminent on the Grand One, paying tribute to the Jeep Grand Cherokee's history. ^ Rothenberg, Al (1 March 1998). "Design Debate - Who's the father of the Jeep Grand Cherokee?". Wards Auto. Retrieved 22 February 2018. ^ Chrsyler, Corporation (1992). The New Jeep. Chrysler Corporation. pp. all. ^ Chrysler, Corporation (1992). The Jeep Book: 1993. Chrysler Corporation. ^ a b "Forest Green Pearl Coat color of the ZJ 5.9". jeep4x4club.ru. Retrieved 2016-09-21. ^ a b "Deep Amethyst Pearl Coat color of the ZJ 5.9". jeep4x4club.ru. Retrieved 2016-09-20. ^ "1995 1996 1997 Jeep Grand Cherokee Orvis Edition 95 96 97 Jeep Orvis Edition". jeeporvis.com. Retrieved 2009-05-01. ^ a b "TSi Jeeps, TSi Grand Cherokees...What does the TSi mean?". North American Grand Cherokee Association. Retrieved 22 February 2018. ^ a b Peterson's 4-wheel & Off-road, February 1998, p. 81. ^ a b Motor Trend, January 1998, p. 51. ^ "IIHS-HLDI: Jeep Grand Cherokee". Iihs.org. Retrieved 2013-03-20. ^ "1993 Jeep Grand Cherokee 4-DR. 4x4 | Safercar - NHTSA". Safercar.gov. Retrieved 2013-03-20. ^ "1994 Jeep Grand Cherokee 4-DR. 4x4 | Safercar - NHTSA". Safercar.gov. Retrieved 2013-03-20. ^ "1995 Jeep Grand Cherokee 4-DR. 4x4 | Safercar - NHTSA". Safercar.gov. Retrieved 2013-03-20. ^ "1996 Jeep Grand Cherokee 4-DR 4x4 | Safercar - NHTSA". Safercar.gov. Retrieved 2013-03-20. ^ "1997 Jeep Grand Cherokee 4-DR. 4x4 | Safercar - NHTSA". Safercar.gov. Retrieved 2013-03-20. ^ "1998 Jeep Grand Cherokee 4-DR. 4x4 | Safercar - NHTSA". Safercar.gov. Retrieved 2013-03-20. ^ Capparella, Joseph (30 March 2017). "Jeep Grand One Concept: The 1993 Grand Cherokee ZJ Gets another Day in the Sun". Car and Driver. Retrieved 22 February 2018. 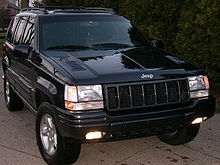 Wikimedia Commons has media related to Jeep Grand Cherokee (ZJ). Wikimedia Commons has media related to Jeep Grand Wagoneer (ZJ). This page was last edited on 12 April 2019, at 02:15 (UTC).